Vertical as opposed to horizontal cliffs? 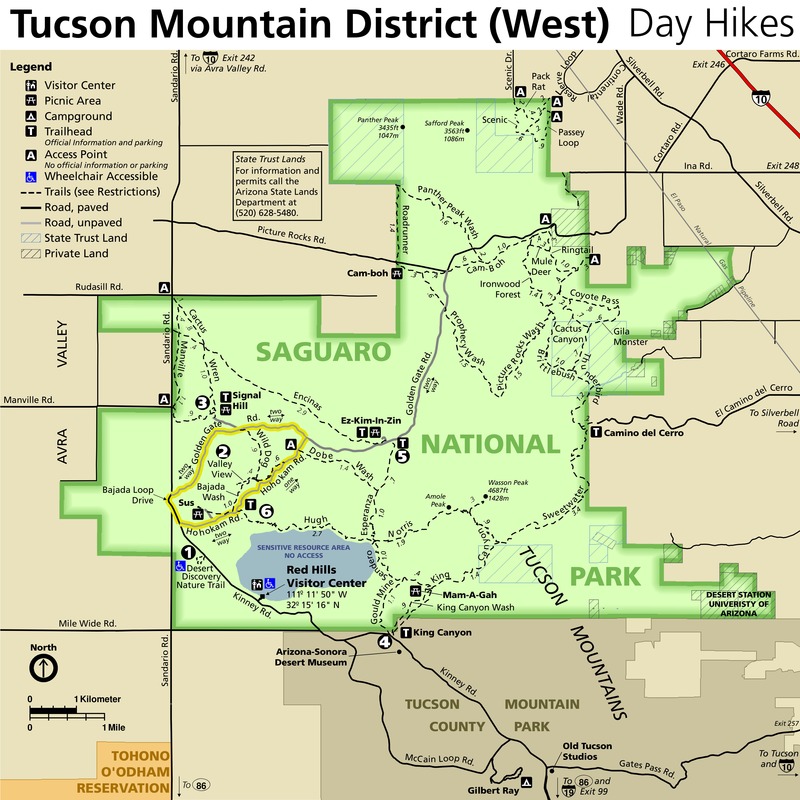 This Loop hike is in the far northeast portion of Saguaro National Park West and is along the Vertical Cliffs, Abington and Animal Wash Trails. 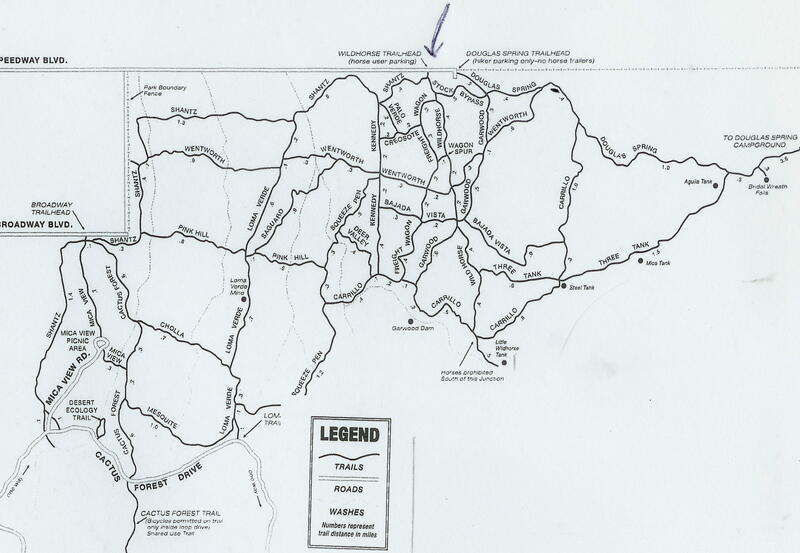 The trail can be done either Counterclockwise, as in this description from the Belmont Road Trail Head or Clockwise from the Abington Trail Head. From Belmont Road the Trail heads south along the El Paso Natural Gas Pipeline Road called the Belmont Trail; this 0.7 mile trail connects up to the trail head at Abington Road. Take the Belmont Trail for 0.1 mile to the Vertical Cliffs Trail, turn right (West). At 0.7 miles in the trail crosses the veteran’s Trail South and in another 0.3 the Veteran’s Trail North. The veterans Trail South heads to Abington Road Access and the Veteran’s Trail north goes 0.4 miles to another access point but I was unable to get any information on this trail. The Vertical Cliffs Trail climbs about 150 feet in the first 1.2 miles and passes by some cliffs to the north of the trail that gives this trail its name. After 1.5 miles the trail heads south paralleling a wash for 0.3 miles before ending at the junction with the Abington Trail. At the junction with the Abington trail is an Aermotor windmill that is located in a wash to the west of the trail. Taking the Abington Trail to the right (west) continues on for 0.2 miles and ends at the Gila Monster Trail. Heading east at this junction the Abington Trail continues for 0.9 miles and ends at the junction with the Veteran's Trail and the Access point along Abington Road. 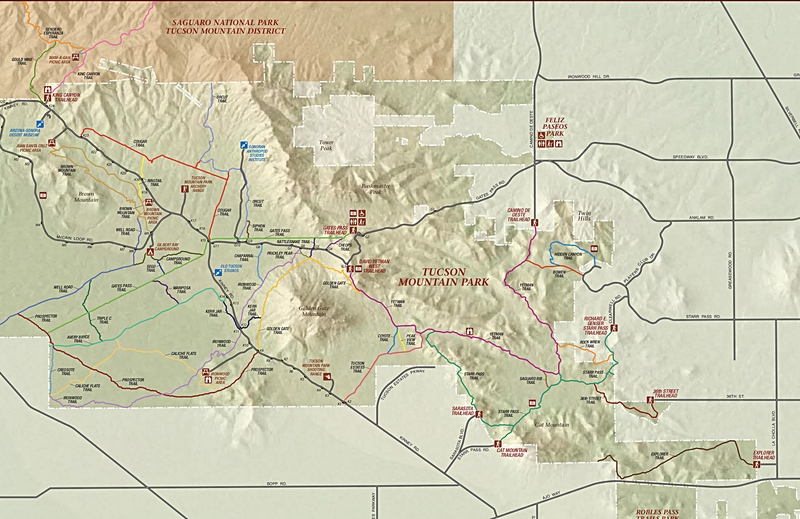 The Abington Trail along its upper end has views to the Northeast of The Santa Cruz Valley and the Catalina Mountains. 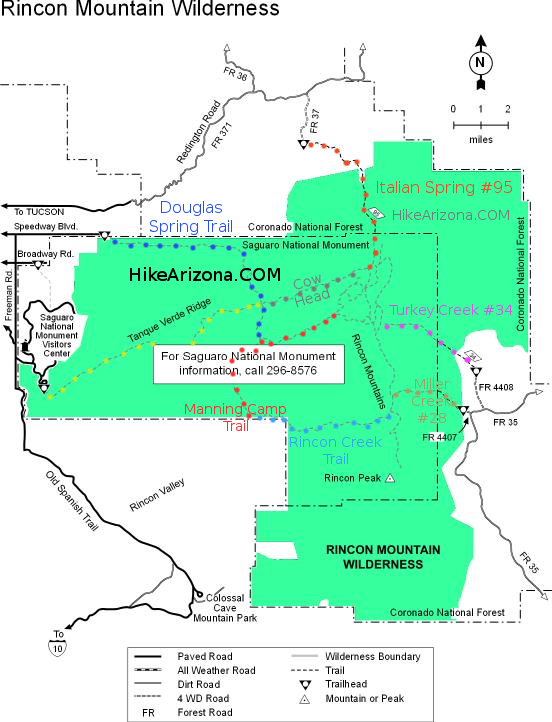 Take the veteran’s trail 0.2 miles north to the junction with the Animal Wash Trail. The Animal Wash Trail drops into Animal Wash after 0.1 miles and remains in this wash for the next 0.9 miles dropping 100 feet to the junction with the Belmont Trail. Animal Wash is narrow and winding with cliffs on one side or the other as it cuts through hills on either side of the wash, makes for interesting walking. Once at the Belmont Trail along the El Paso Pipeline Road head north along the Belmont Trail 0.2 miles to the start point of this loop. I started this hike before sunrise at the Belmont Trail head. The Vertical Cliffs Trail heads west along a fairly rocky trail gaining about 150 feet in the first 1.2 miles. The trail crosses the Veteran’s trail south at 0.7 miles and north bound Veteran’s at 1.0. At this point the sun was just touching the hills to the north of the trail revealing the volcanic cliffs that gave this trail its name. These cliffs are not very high but they were vertical. I couldn’t help but wonder why Vertical Cliffs, is there another type of cliff? Maybe they didn’t want us confusing them with the Horizontal cliffs. 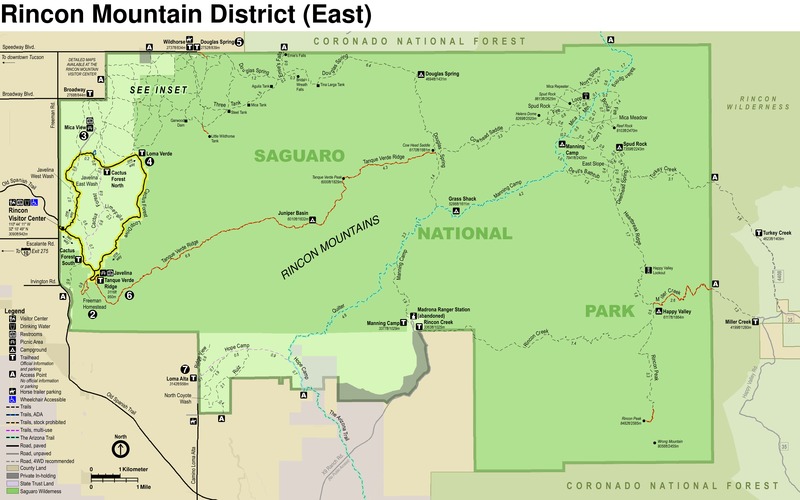 Although the Kaibab Plateau means mountain lying down so who knows. After spending a good amount of time pondering this I got back to the scenery around me with the views to the Northwest of Picture Rocks Peak, Safford Peak and the ridge that follows just to the north of Picture Rocks road to Panther Peak. Wasson peak was to the southwest. At 1.5 miles the trail heads south paralleling a wash with a sign indicating the change of direction. At this junction there is a faint trail heading to the north down into the wash and this leads to the Old Yuma Mine. I took this route but that is for another description. On returning from the Yuma Mine I continued on this trail for another 0.3 mile to the junction with the Abington Trail. At this junction there is a Aermotor windmill in the wash to the west of the trail. I took the Abington Trail west for 0.2 miles to the junction with the Gila Monster Trail. Just after crossing the wash where the windmill was the wind started blowing and there was a squeaking sound, the windmill turned facing into the breeze and slowly started rotating, and that’s when I noticed that this was still a functioning wind mill (Didn’t notice if it was pumping anything but it was turning). Once at the Gila Monster Trail I returned heading back on the Abington Trail. While hiking the Gila Monster Coyote Pass Trails a few weeks ago I noticed this sign in the wash indicating the Abington Trail, until then I didn’t know these trails in the far northeast side of the park existed (not on all park maps). The Abington to the Veteran’s Trail is 0.9 miles mostly downhill after a small 50 foot rise. Fairly easy going along this trail with a few rocky spots as you drop down the last 100 feet to the Veteran’s Trail. On the last half of this hike houses are visible 0.2 miles to the south. At the junction with the Veteran’s Trail, head north to the Animal Wash Trail. The Veteran’s Trail continues on up the hill and connects with the Vertical Cliffs Trail 0.2 miles after the junction with the Animal Wash Trail. 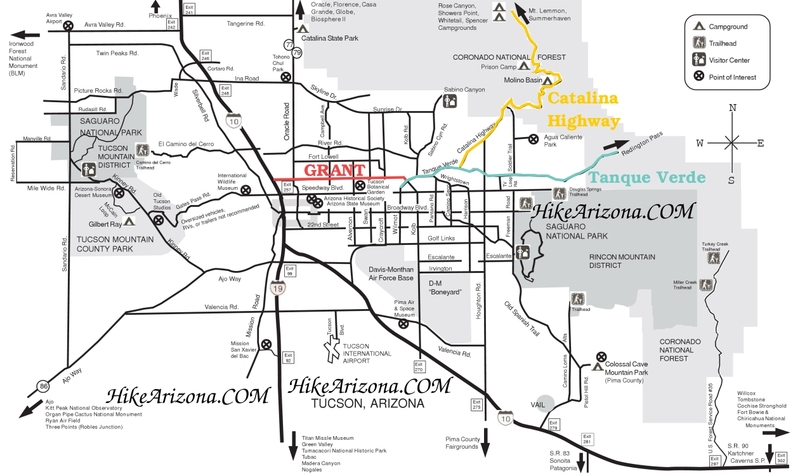 Animal Wash Trail is 0.9 miles long and is fairly interesting in that it is a narrow wash and cuts through a couple of low hills that are ending as they drop down into the Santa Cruz River Valley. The wash does a lot of twists and turns with cliffs on one side of the wash or the other, exposing the layers underneath those hills. This trail ends when it reaches the El Paso Pipeline Road. Take this road 0.2 miles north back to the Starting point of the loop hike. Taking the road south 0.4 miles will lead to Abington Road about 0.9 miles east of the Abington Road Trail Head at the Abington and Veteran’s Trail Head. Interstate 10 in Tucson, Take Ina Road west to Silverbell Road head South to West Belmont Road. Turn west on West Belmont Road 1.3 miles to the Trail Head along the El Paso Gas Pipeline Road. Parking on south Side of road.